Well joy of joys I found myself with some free time this week now that my niece's quilt is done so jumped onto the sewing machine and whipped up some more broken herringbone blocks. I came across these blocks a few months back when Molli Sparkles shared some photos on Quilt Club Australia and put the tutorial aside to do 'one day'. Wouldn't you know that one day came sooner than planned when Molli (aka Josh) hosted a quiltalong. I did make some then but with all the family dramas going on around here over the last few months I did fall by the wayside and didn't finish. A while ago I mentioned I was making these blocks and that I had found myself short of a couple of colours and the lovely Susan was kind enough to send me some leftovers she had from her stash. What a lovely lot of leftovers they were too! Thank you so much Susan, they were so helpful, even if it took me a while to get around to using them. Quite a lot of Susan's pieces made it into those two! All the fabrics in this gorgeous teal blue block above came from Susan's leftovers. 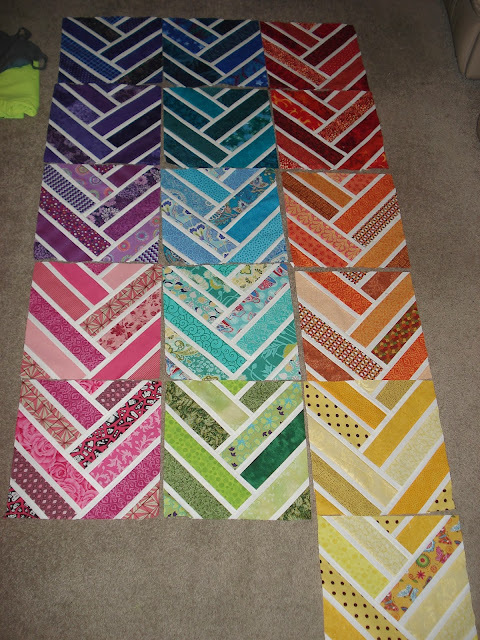 Love to see the quilt you made with these, they're gorgeous together! Not entirely thrilled with the last block, although it looks better in real life than in the photo it is a mix of too many blues I think. I will have to have a search for more deep indigo blues I think! More greens to come I think, along with some very dark blues. Perhaps another lighter purple too? I'll just keep making the blocks and working it out as I go I think. I love rainbow quilts, these blocks look great! Ooh your rainbow blocks are looking just lovely all together! this is coming along beautifully Sue, glad you finally found time for yourself . Its looking great. It would make a greast group project too. I'll send you a link of the teal quilt. Test Drive of a Christmas Cocktail!